MyWay Mobile Storage of Baltimore donated portable storage units to the 20th Annual MSP Polar Bear Plunge benefiting Special Olympics of Maryland for the 7th consecutive year. MyWay Mobile Storage of Baltimore donated portable storage unites to the 20th annual Maryland State Police Polar Plunge benefiting Special Olympics of Maryland for the 7th consecutive year. 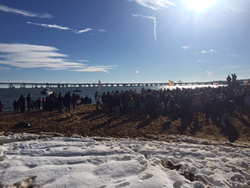 MyWay Mobile Storage of Baltimore helped thousands of people brave the icy waters of the Chesapeake Bay on Saturday, January 30th at the 20th Annual Polar Bear Plunge, sponsored by the Maryland State Police. For the seventh consecutive year, MyWay Mobile Storage of Baltimore donated four portable storage containers for the event staff’s use.